Throughout these past few weeks, I have continued to be amazed by the young scholars. Their incredible awareness and insight have been a joy to witness. Every day they are teaching me something new, such as how powerful our words can be. When I have phrased things in particular ways, they catch on immediately and make new connections. For instance, during one of my classes on Langston Hughes’ poem “I, Too”, we were discussing racist actions and why they hurt and one of the scholars piped up and said, “Because it’s like sandpaper”. Talking about sandpaper words vs. cotton ball words was the very first lesson I taught the scholars. It was a lesson on how we want to practice using words that make people feel like cotton balls inside, comfortable and nice, not rough and painful like sandpaper. After a week passed in which I didn’t mention the first lesson again, this scholar remembered and connected it to our current lesson! I realized then how, in my position of power, my words held power as well, and they were making an impact on these scholars. Seeing the influence I had on these scholars reinforced my confidence and the passion I have to bring my best every day for them. Sharon is a rising junior at Wellesley College where she studies Philosophy and Peace & Justice Studies. Through Wellesley's Lumpkin Institute, she learned about St. Stephen's and is now working as an Academic Intern on the A-TEAM. Sharon discovered her passion for community service in middle school and continued to pursue it throughout high school where she volunteered with non-profits such as Big Brothers Big Sisters of America. Although she does not know yet what her career plans are after Wellesely, she is dedicated to working with underserved communities. In her spare time, Sharon enjoys going for long walks, philosophizing with friends, drawing, and watching Grey's Anatomy. On Friday, July 20th, the JCITs from Epiphany and St. Augustine and St. Martin traveled their way outside of the city into Fitchburg, MA. The scenic route wasn’t something we got the opportunity to see often. Long roads, lots of trees and green on green was a nice break from the city skyline and the millions of cars and pedestrians we see on a day-to-day basis. As we got off the bus, we were greeted by long-time St. Stephen’s friend and supporter, David Weiss, who is the Associate Professor of Criminal Justice at Fitchburg State University. It was apparent that both he and the JCITs were excited to get the info session and campus tour started! The info session was exactly what the JCITs needed in order to become familiar with Fitchburg State University, learning about it’s majors, minors, mission and extracurriculars. They were encouraged to ask a lot of questions, which they began to do even more when they realized popsockets were the reward! Our ninth graders were informed about financial aid, scholarships, what the university looks for in their applications, and that video gaming and nursing are two of its most popular fields of study! We moved our way onto the campus tour, where the JCITs had the chance to see the recreation center, a dorm room, a lecture hall, the library and best of all, the university’s new science building! Along the way, the JCITs continued to ask good questions and every once in awhile I would hear one of them say, “This is such a cool college” or “I want to go here!” With a beautiful and sunny day, lunch being provided and wonderful tour guides, the JCITs left feeling good about the day and their ability to find a college that fits their needs and interests. As a young adult who moved across the country to go to college, I believe in the importance of exposing our youth to places other than those they grew up in. This field trip will help the ninth graders realize that there is so much more out there than just Boston and that they don’t have to go to college right near their homes. New places bring new people, new experiences and new perspectives! Thank you David Weiss and all those involved in the planning of this visit! 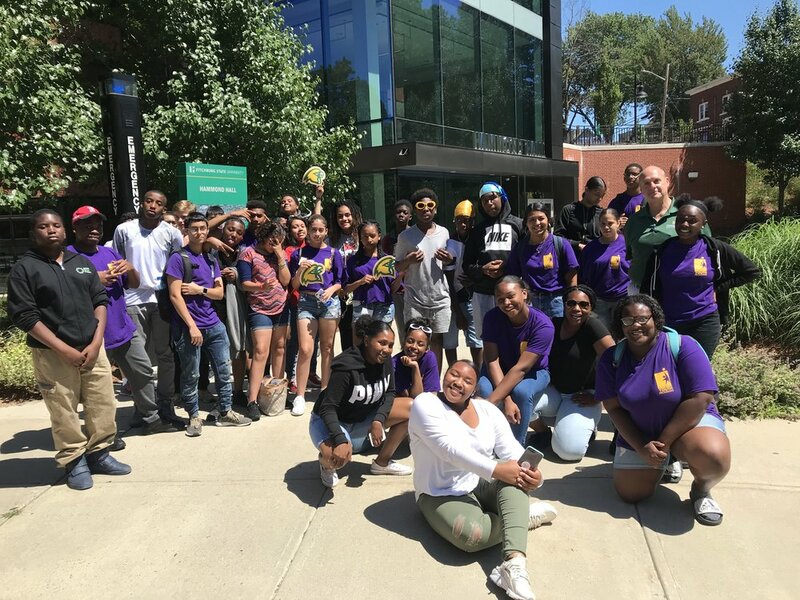 We cannot wait to bring our ninth graders back to Fitchburg State University next summer! Bella joins us as an AmeriCorps Massachusetts Promise Fellow and began in August 2016 as the Junior Counselor-in-Training Program Coordinator for our academic school year programming. Graduating with a Bachelor of Arts in Global Studies and Human Services from Lesley University, she comes with a love and passion for providing the ninth graders she works with, with a compassion-filled, engaging and social justice driven environment. Bella is from Carlsbad, California and moved to Cambridge, MA in 2012 after being recruited to play NCAA Division III soccer at Lesley. She will complete her second year of service at the end of July. How did we get to a place where it is ok to consider women's bodies a symbol of weakness and fragility? When for most of us it is our passage leading to existence in the game of life. I love basketball, and think that for those engaged in playing the sport, we learn and teach many lessons. When Draymond Green of the Golden State Warriors put his finger in LeBron James’s eye during one of the most watched games in this sport, the finals, instead of apologizing, he called him (LeBron) a derogatory term referring to the female genitalia. One does not have to be a father or a husband to think of this as problematic and endemic to one of our many dilemmas, “toxic masculinity”. We men have been taught behavior and vocabulary that’s toxic and violating to our communities and when this toxicity is left un-interrogated and unquestioned, it festers and gets handed over to the next generations of men, our young boys. With this said, I think it is easy to see how one of the most famous athletes in the world can have the power and advantage to extend these lessons at an accelerated and bigger scale. Can you imagine how many young boys around the world were watching that game? Is it still surprising why more people report of being violated by men and boys in many communities? At B-SAFE this year I will be using all the tools I have as an Applied Drama and Theatre practitioner to lead a series of workshops with young men at both St. Stephen's and at Epiphany. Our curriculum is titled Live Respect, and it states clearly that toxic masculinity is not to be considered a right of passage into manhood. Our goal in these dialogues is to have this challenging and less-discussed topic, masculinity, broken down and questioned, in a safe, brave and well resourced environment. As a father and a theatre practitioner, I am a firm believer that participants/young people are not empty vessels. The young men are teaching each other what they have learned thus far in their young lives. They must learn to question themselves and their peers about the "Box that Men are Placed in", the rules of subscribing to this box, and how can one negotiate a way out of the biases and stereotypes of being male members of the community. I think we got to this place by not having these difficult conversations about how we refer to woman’s bodies as symbols of our humiliation. I think we got here as men through being dehumanized ourselves and made to feel disempowered, making us also want to dehumanize and disempower others in our communities who seem less strong, less important, not as physically strong as some of us might be. So when Draymond acted in the ways he did, he wanted to dehumanize LeBron and hope that everyone else considers him (LeBron) less of a man, less brave and less strong as he (Draymond) is. Butana Petros Molefe started working as a community developer in his teen years after he successfully completed his Grade 12 in Orange Farm, a township south of Johannesburg-South Africa. In his work as a Facilitator/ community mobilizer he has had the honor to meet and converse with global statements such as Nelson Mandela, Bill Clinton, British Prime Minister Tony Blair and the beloved Reginald Desmond Tutu. His areas of research are HIV/Aids, LGBTQ, Sexual Health, Community Enhancement, Gender, Sexuality, Social Justice and more. Recently, through his work Butana travelled to countries such as Botswana, Taiwan, and the US. Apart from his professional work, Butana also volunteers his skills as a theatre maker, theatre scholar, an applied theatre practitioner, a community developer to organizations such as the Soweto Kliptown Youth Foundation, Tshulu Trust and the Hillbrow Theatre, to mention but a few. Butana also holds a Masters Degree in the Arts, and is currently pursuing a Masters Degree in Divinity with the leading seminary in the world, Harvard Divinity School. This summer has already shown me so many ways to share kindness. The most rewarding part of my job here is seeing the smiles on our participants' faces. I see smiles while reading our theme book Wonder, as they experience the exhibits at the NE Aquarium while watching the jellyfish wiggle through the illuminated water, and as they enjoy a family style lunch together with their friends. As a teacher, there is no greater joy than to witness the wonder in a child's eyes as they concentrate intensely as they paint a still picture of a plate of delicious donuts or play soccer competitively. It has also been a summer of immense personal growth. Coaching first time teachers and young adults who show a passion for sharing their knowledge, hearing their stories and challenges, and encouraging them to think of themselves as enough, reminded me of what teaching really means. Sharing my days with the amazing collection of humans that do this work for the same reason that I do this work was a true pleasure...make our participants Feel Safe, Feel Big, and Feel Connected! Christina Vidaña started with St. Stephen's as an Academic Specialist teaching Humanities in June 2017. This year she comes to us as the Academic Administrator responsible for the LEARN side of the program (400+ elementary participants). Christina has 12 years of experience in education and is fulfiliing her passion as a Third Grade Teacher at Our Lady of Perpetual Help Mission Grammar School. She has a zest for life and absolutely adores her scholars and working with children. She has been married to Dann for 27 years and has two beautiful daughters who are also involved with St. Stephen's, Bella and Sophie. I gave my students a task to analyze and deconstruct one of Langston Hughes’ most renowned poems this week. They. Mastered. It. The participants enjoyed having the space to think critically of a poem that is relevant today and the opportunity to talk about the impact of words on society and on the self. Anani is a rising senior at Wellesley College, majoring in English and Spanish. During her junior year, she worked with the Wellesley College’s Civic Engagement office where she was first introduced to the St. Stephen’s program and is now interning here as a member of the Academic Team. She is originally from Los Angeles, CA and moved to MA for college. She loves to travel (will be going to Santiago, Chile in the fall! ), go for runs, and loves to cook! After my last year as a site manager for B-SAFE, I noticed an opportunity for program growth. 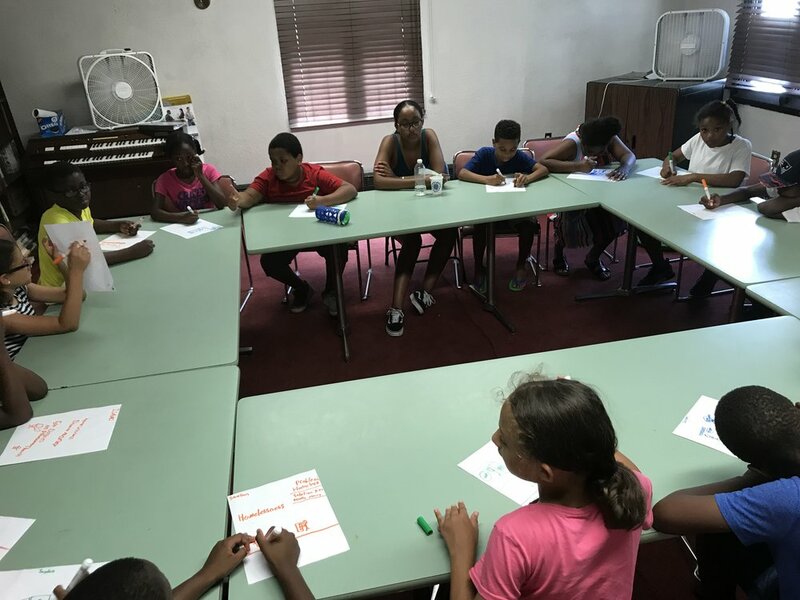 Our middle school Youth Leadership Corps (YLC) program was in need of a reboot to make thoughtful and deliberate changes that reflect the youth we serve. It seemed counterintuitive to expect our middle school students to rise to the expectation of leadership while doing the same programming as our youngest ones. Also, the impact of media, hormonal changes, our current social climate, life transitions (elementary to middle school or middle to high school), and community/peer pressures puts our 6-8th graders in a completely different mental headspace. It opens up a need for different conversations, different workshops, and differentiated learning approaches. It’s harder to have conversations about voting/elections, toxic masculinity, the importance of giving back, and setting financial goals with elementary aged students, but it is the perfect time to start with our budding teenagers. The Bishop’s Summer Academic & Enrichment (B-SAFE) Program always looks to find role models for our youth to look up to. In previous years they were Mae Jemison, Kamala Harris, and Michelle Obama. Representation has always been important for our program because a majority of the students we serve come from neighborhoods stricken with violence and poverty. There is something empowering about seeing a person who looks like you do powerful and positive things. Unfortunately, due to environment, society, and media our youth come to us bombarded with images and misconceptions about their futures and we try to make deliberate steps to flood these negative ideas out with positive ones. For B-SAFE 2018 YLC students will be engaged weekly in academic enrichment, community service projects, and field trips that inform and inspire. Each week we will be delving into new ways to live out our theme-- “Disrupt, Remold, Create”. This includes participating in workshops to disrupt the way our minds have been conditioned to think by society, field trips that teach us how our government works and what it takes to remold it, and creating art for our communities that is socially relevant. There will also be a Yara inspired academic rotation where we explore topics that Yara is passionate about. Our goal is to create a community of young leaders that are socially conscious, believe that they can effect change, and represent a voice that is often unheard and undervalued. We hope that each participant can seek out their own individual strengths and discover new ways to contribute to the world around them. I am Vicky Ajene, a 27-year old fashion designer and alumni of the B-SAFE Program. I grew up in the arts, attending Boston Arts Academy for Instrumental Music and Lasell College to receive my B.A. in Fashion Design and Production. After college I freelanced as a designer for PUMA and J.Jill and later went on to teach at Lasell College as an adjunct professor. What I hope to bring to the program is a sense of community and an outlet that encourages kids to explore their creative sides. Who runs the world? Teens! This summer SSYP, in collaboration with the Boston Center for Youth and Families, Chelsea Collaborate, and the Attorney General's Office, is providing 181 jobs and internships at our sites. Teens are working as tutors and mentors, field trip chaperones, peace walk coordinators, workshop designers, leadership development facilitators, and so much more! Teen staff make the magic happen and they go above and beyond to create a space where all participants Feel Safe, Feel Big, and Feel Connected. Kasey initially joined the staff of St. Stephen's Youth Programs in the summer of 2013 as a Teen Staff Coordinator for B-SAFE. She has her masters in International Education Policy from Harvard Graduate School of Education. Kasey grew up in Dunedin, Florida and moved to Boston for graduate school after living abroad in Liberia, West Africa. She is passionate about using education for positive social change and strives to increase the professional development of our teens and prepare them for college and their careers. Reach Beyond: Celebrating our Graduates! For the fifth year in a row, the St. Stephen's Youth Programs community came together to celebrate all our high school seniors in our event entitled Reach Beyond. This year St. Stephen's celebrated our 20 high school seniors, all of whom not only graduated from high school on time, but graduated with a clear plan for what they are doing after high school. Students will be attending Wellesley College, Newbury College, U-Mass Amherst, Fitchburg State, Mars Hill University, U-Mass Dartmouth, MCLA, Quincy College, and Bunker Hill Community College, as well as participating in first year transition programs such as The Base Freshman Year, Year Up and Laboure Nursing School. Reach Beyond provided the opportunity for seniors, families, St. Stephen's staff, other teenagers, mentors, volunteers and board members to come together and show our high school seniors how proud we are of them, and how we are going to continue to support them on their next steps. In addition, the event featured several key speakers who helped showcase the breadth of the St. Stephen's Community. Anna Rodriguez, a St. Stephen's alum, and 2018 graduate of Tufts University spoke about the power of changing the stereotype and narrative of young people of color. Maureen Burns, the former School and Community Partnerships Manager highlighted the power and importance of mentoring. Finally, Rebecca Jackson, a St. Stephen's Advisory Board Member and the Director of Training at Trinity Boston, highlighted the importance of continuing to persevere no matter what the world throws at you, and how proud our seniors should be of what they have accomplished. In addition to celebrating their accomplishments, St. Stephen's was proud to announce and award the first ever St. Stephen's Support Fund scholarships. This fund was set up to celebrate seniors and alums who have shown themselves as leaders in the community, and is intended to help fill the financial gap of higher education that exists for so many students. This year 18 St. Stephen's seniors and alums were given awards through the fund. St. Stephen's is so proud of our young people who are all doing such amazing things, and wish them nothing but the best as they take these next steps. Jeremy graduated from Colorado College with a Degree in Political Science and Urban Studies in 2012. He came to St. Stephen's through the Massachusetts Promise Fellowship program, an AmeriCorps program where he served for two years. Jeremy was then hired on as the Sr. Manager for College Access & Success, where he is focused on supporting our high school students and alumni on their post high journeys. During the summer he is the Site Manager for the Middle School Youth Leadership Corps program. He brings a passion on working towards increasing access to higher education for low-income students, and is dedicated to helping support students in achieving their own college and career goals. This year St. Stephen's hosted it's first ever high school senior retreat. This event served as an opportunity to celebrate all our seniors on their amazing accomplishment of graduating high school. Seniors joined staff for breakfast, where they shared the biggest challenges and obstacles they are going on face in this next step. Next, the group set out on a sailboat cruise on the Boston Harbor, a unique opportunity that none of the staff or teens had ever experienced. Finally the group retreated back to St. Stephen's for lunch, where they talked about how the alumni program at St. Stephen's can continue to support them during this next step in their journeys. The retreat was a wonderful opportunity for this amazing group of high school seniors to come together and realize that they have a wide range of people who are there to support them during the next step. The B-SAFE Junior Counselors in Training (JCIT) Program works with rising high school freshmen to develop professionally and learn about and engage in leadership activities. A part of this development means being placed into different LEARN groups and acting as supports to the Leads and CITs, while also taking on new responsibilities of behavior and group management. When they are not working with the youth, JCITs participate in professional development by welcoming outside trainers that come in and teach them about different topics and issues in the community. And last but not least, the JCITs also take part in field trips that encourage them to be civically engaged. These range from visits to parks and beaches to college tours and museums! After working hard in their groups all Tuesday morning, the JCIT's of St. A&M and Epiphany took a well deserved trip to LoPresti Park in East Boston. They played basketball, football, soccer and many other planned activities run by the JCIT Coordinators and Site Assistants. While some teens cooled down in the shade, others decided to jump through the cold sprinklers. The best part about the day was the amazing view of the Boston skyline and seeing our city from a new perspective. This is only the first of many adventures the JCITs will have the opportunity to experience! Born and Raised in Morocco, Walid moved to the US at the age of 10. Walid started working with SSYP as a JCIT and worked his way up to JCIT assistant coordinator. He is returning for his 5th summer at B-SAFE. He is very passionate about working with kids and bringing change to the South End. He graduated from O'Bryant High School and is looking forward to pursuing further education at ENC. It is time! We are ready for our NINETEENTH summer of the B-SAFE Program (Bishop's Summer Academic and Fun Enrichment Program)! Staff are hired, field trips are scheduled, teens are employed, young people are registered, academic themes are picked, lessons are planned, lunches are scheduled, and a ton of fun is around this corner. Last week, all B-SAFE staff--all our adults and teens--gathered at Epiphany School for training and coaching on B-SAFE's values, policies, and programs. On Monday, July 9, B-SAFE welcomed young people through the doors of our sites and start the work of helping them to grow, learn, and thrive. One of B-SAFE's chief goals, in addition to building academic skills and having fun, is to develop the leadership of young people and adults. This summer, fully half of our Lead Counselors and Teaching Specialist positions will be filled by young adults who started their connection to B-SAFE as participants or teen staff. For our thirty-person senior leadership team, including Site Managers and Teen Staff Managers, 75% either participated in B-SAFE as a young person or are getting a promotion from a different role within SSYP. Latasha Scott served as a B-READY YLC Lead Counselor this past school year; this summer she will be a B-SAFE Teen Staff Manager. In the fall, Latasha will return to B-READY as the YLC Site Coordinator and Massachusetts Promise Fellow. Walid Harkous has served for several years as a Counselor-in-Training for several years. This summer, Walid will be the Site Assistant for the JCITs at St. Augustine and St. Martin. He just graduated from the O'Bryant and will be a first-year student at Wentworth University in September. Angie Hyppolite worked as a Teen Organizer this school year, helping to lead B-PEACE's campaign to get a meeting with the CEO of Smith and Wesson (still waiting...). This summer, Angie will be the Site Assistant at Holy Spirit. A few weeks ago, she graduated from Boston Day and Evening Academy; in September, she will be starting at The Base. Vicky Ajene worked this past B-READY year as an amazing Creative Arts Specialist. This spring and summer, as the YLC Academic & Program Administrator, Vicky is one of the top leaders making B-SAFE happen. Vicky has worn many hats at SSYP, starting nearly ten years ago as a teen Counselor-in-Training. In September, she returns to SSYP in a year-round, full-time role: Manager of Academic and Enrichment Programs. Each of these leaders earned their new responsibilities through hard work, dedication, and love for young people. Congratulations to each of them and all the other staff stepping into new leadership roles. And now, let the fun begin! Liz Steinhauser joined St. Stephen's staff in 2003. She brings over 30 years of professional training and experience as a youth worker and community organizer to the position. Liberation theology developed her commitment to social justice. Girl Scouts built her arts and crafts skills and her repertoire of goofy songs. She is a graduate of Colgate University and Harvard Divinity School and is an ordained priest in the Episcopal Diocese of Massachusetts. She lives in Roslindale with her modern family. Blackstone School Parent Mentors Celebrate and Graduate! On Monday, June 11, our first full-year class of Parent Mentors graduated with stories, certificates, proud moments, and much celebration! The Parent Mentor Program is based on the model developed over decades in Chicago with Logan Square Neighborhood Association. Back in September, parents of students at the Blackstone Innovation School applied for positions as parent mentors, paid jobs that would place ten parents in ten classrooms, mostly Kindergarten and First Grade rooms. Each parent was paired with one teacher and then worked to support the learning and the teaching of the community four mornings a week. Parent Mentors helped students read aloud, practice their letters or numbers, resolved conflicts between young people, and retied shoelaces. In short, the Parent Mentors helped the young people in these ten classrooms feel like and actually be great scholars. The graduation ceremony included testimony from each Parent Mentor speaking of how they had experienced transformation of themselves and their learning, of the Blackstone School, and Boston Public Schools. Teachers hugged the Parent Mentors and spoke of their own transformation, having felt the power of their partnerships. Together with over 100 other parents mobilized through SSYP's Parent Organizing Project, more than $16.4 million will be added to public education budgets in School Year 2018-2019. And SSYP's mission statement has evolved to recognize the central role of parents: SSYP's mission is to promote equity in education, employment, and opportunity through long-term relationships with young people and their families and communities. More about this program, the impact on the school, and research that shows how it helps to improve the academic skills of students in a future e-news. In the meantime, HUGE CONGRATULATIONS to Lead Parent Organizer Ariel Branz, Parent Mentor Coordinator Rafaela Polanco, and all ten Parent Mentors!! At. St. Stephen's, we believe in exposing our youth to all sorts of new experiences and activities. We do this in a couple of different ways, such as Imagination Stations or Choice Time. During Choice Time the youth get to chose a different activity weekly. In contrast, Imagination Stations are designed to enhance a skill or teach youth a new skill throughout a 4 week period with a presentation/ exhibition at the end. This year we had two Imagination Station series in which the youth were able to learn some new and cool skills! Each series usually offers 4 different options for the youth to chose from. Our first series offered Photography, where the youth learned how to use disposable cameras to take pictures in different lighting and angles, Drumming, where the youth learned the basics about reading sheet music and playing percussion instruments, Sculpting, where the youth learned how to mold clay into different animals, and Comic Book Making, where the youth learned the different parts of a story and how to turn their stories into comic strips with illustrations. Our second session offered Basketball, where the youth learned different basketball drills and best techniques, Cultural Cooking, where the youth created dishes and pastries from different countries, Self Portraits, where the youth used a grid method to paint self portraits, and Origami, where the youth learned the art of folding paper into different animals and flowers. On May 4th, we spent our Fun Friday celebrating Cinco de Mayo at St. Augustine and St. Martin's! The students participated in activities such as salsa making, piñata breaking, and lots of fun treats! We learned about why Cinco de Mayo is called Cinco de Mayo. Some of our kids went all out and said that they were going to make the “spiciest salsa EVER” while others made a more manageable salsa. All of our youth enjoyed the day and were able to go home with some memorable treats to share with their family! On Tuesday May 1, the ninth grader leaders of St. Stephen’s Youth Programs, known as the JCITs (Junior Counselors in Training), unveiled a community art piece at Ramsay Park near their Lenox Street program location. The team of JCITs was inspired by gallery walks and videos that depicted politically-charged installation artworks by artists such as Ai Wei-Wei and Jean Michel Basquiat. The students decided they wanted to create their own work that would make viewers stop and think. Adult staff from St. Stephen’s Youth Programs, along with a Tufts Tisch Scholar and a Lesley University graduate art therapy intern worked alongside the students to make the art installation happen. The student group used flagging tape as the main medium of their artwork, weaving it into an isolated chain link fence to create an image in Ramsay Park. Flagging tape is a material typically used to mark off borders and boundaries. The image read, “Change Will Come,” a phrase the young artists adapted from a speech they heard on gun violence. In the talk, President Barack Obama said, “If Americans of every background stand up and say, ‘Enough! We have suffered too much pain, and care too much about our children to allow this to continue!’ Then, change will come.” All of the student artists wrote their hopes, dreams, experiences, lyrics, and hashtags on pieces of the flagging tape and added each to the fence in order to contribute to the larger whole image of words. Ramsay Park, where the art is installed, is a Lower Roxbury-South End park where positive change is coming. The progress is quite visible, thanks to the efforts of SSYP, other Lenox-area teen groups, and the City of Boston’s Parks and Recreation Department. 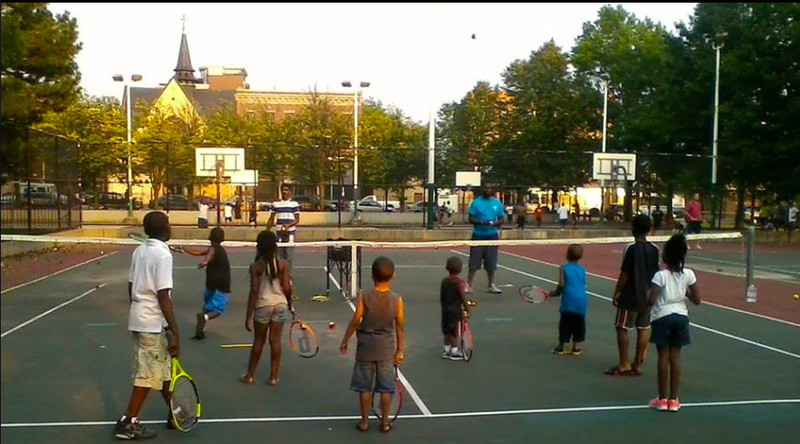 In the summer of 2015, a coalition of organizers brought in positive programming to Ramsay Park, including a basketball league, tennis lessons, mural painting, and flower-planting. This led to a commitment from the City of Boston to improve the park. At the State of the City in January 2016, Mayor Marty Walsh announced a commitment of $2.4 million of city funds toward a full renovation of the park. 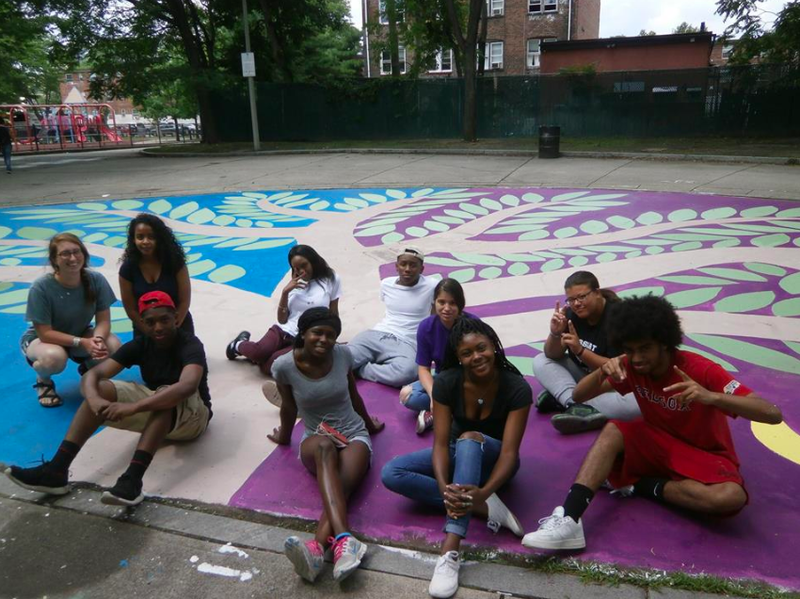 The JCITs of St. Stephen’s Youth Programs continue to create positive change, this time with art. Community members--children and families--gathered in Ramsay Park to celebrate the art installation with a ribbon-cutting ceremony. Two JCITs spoke movingly about their creative experience and the purpose of the artwork. Then, all the JCITs encouraged community members to participate in the process of creating art by adding their own thoughts on neighborhood violence to the installation. Under sunny skies, people enjoyed the springtime weather; children played and a neighbors hugged. Passers-by stopped to inquire about the bold and black words, “Change Will Come.” The JCITs wanted their art installation to create joy and inspire conversations. They achieved their goals and felt powerful and visible in the process. As with all installation art, the JCITs were aware that their artwork was temporary. Still, they were surprised that it took only two days for workers from the City of Boston to cut down the art. A JCIT staff member asked one worker what was happening. With regret, he said, “I knew [the artwork] was something good but had to do what I was told.” The conversation took place next to a pile of hypodermic needles that had yet to be removed. The words of the art installation took on even more meaning and urgency in the presence of this seeming contradiction. How could beauty be removed while danger remained? Nevertheless, the JCITs believe that even ephemeral art has the power to influence viewers and may still bring change to a neighborhood. The creative process certainly brought transformation for these young artists. Last trimester, we decided that we needed a student council to allow our youth to have more voice in several different aspects of program. We called our student council Kid President Council and opened the positions to our kids. Each group had to pick two students to represent them starting the second trimester. The kids who were interested had to come up with a campaign and persuade their peers to vote for them. They came up with slogans such as, "Good Food = Good Moods. Vote for Adrian!" At the end of two very long weeks we had eight members. Since starting our Kid President Council the eight youth involved have been quite excited and active when it comes to the tasks we set out to accomplish. In our initial meeting we established that they would come up with a field trip, a snack, and choice time options. After the first meeting the members left with the task of coming up with a field trip they and their peers would like to go on. Each pair brought two trips to the second meeting that they had chosen in their group, the other council members voted, and soon we will be taking a bus field trip to the aquarium! At the end of the second meeting the kids were tasked with coming up with one snack they would like to eat during program. When the day came to meet we did not have all members present so Sandy decided to postpone the meeting. The council members that were present made sure they kept Sandy accountable and gathered to meet two days later after Sandy had forgotten to reschedule the meeting. They spent an entire afternoon looking up prices and quantities, running back and forth from the kitchen to the office, asking all the right questions about dietary restrictions and attendance to make sure they did not order things we already had or could not serve. That Friday three council members took it upon themselves to order snack for the program for an entire week and stayed within budget! 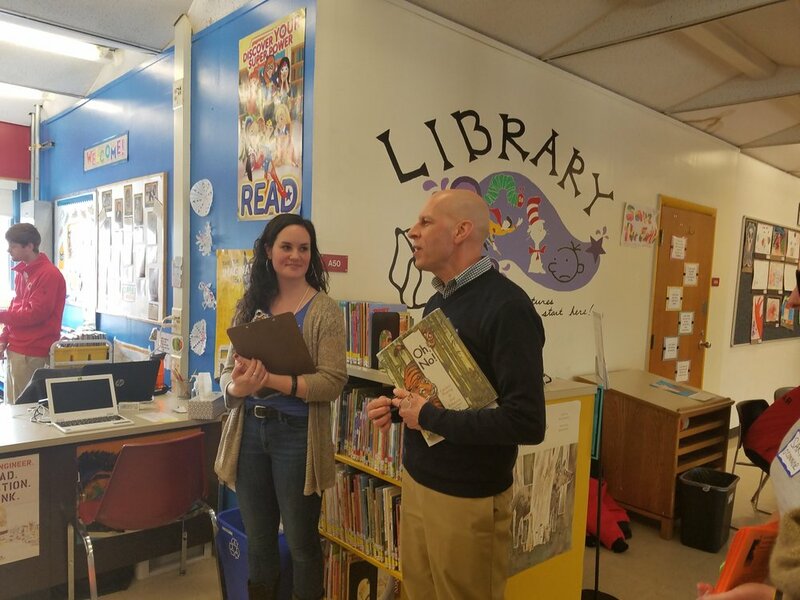 On Friday, March 9, St. Stephen's Youth Programs and City Year hosted a literacy celebration- the Blackstone Innovation School’s Eighth Annual Read Across America Day! This is a nation-wide event and is timed to fall near the birthday of many youngsters' favorite author, Dr. Seuss. Here in the South End, forty volunteers from non-profit organizations, faith-based groups, and corporate partners gathered in the Blackstone Library. Reunion Christian Church, a congregation that meets in the Blackstone’s auditorium, and Bain Capital, the Blackstone’s City Year sponsor, were among the most well represented groups! Each adult reader picked out a book and then joined a classroom for an afternoon of reading. Students eagerly greeted volunteers, asked them questions about their jobs, listened to stories, and shared books. Starting in 2011, the Blackstone Innovation School and St. Stephen's Youth Programs have worked together to create a fully-functional library in what was previously a dusty storage space. Thanks to the dedication of many volunteers as well as funding from Parish of the Epiphany in Winchester, the school now has a top-notch library. Blackstone’s library boasts more than 12,000 volumes that are catalogued in an online database, has a subscription to EBSCO, hosts annual author visits, and celebrates this Read Across America Day each year! Every week, twenty-four classes full of smiling, excited students visit the library for read aloud time, the opportunity to borrow books, the chance to travel the world thanks to the magic of reading, and to build their literacy skills. The Blackstone Library manages to do all this thanks to the resources of non-profit organizations and churches and the time of volunteers. The Blackstone Library is staffed solely by volunteers and yet it is one of the few public elementary schools in Boston that is open Monday through Friday. Currently, Boston Public Schools has only nine certified elementary schools librarians on staff, serving about 75 schools with elementary age students. This makes school partners, like St. Stephen’s Youth Programs and City Year, all the more important. To support the Blackstone Library’s growing collection, check out their book wish list at portersquarebooks.com/wishlist/280. 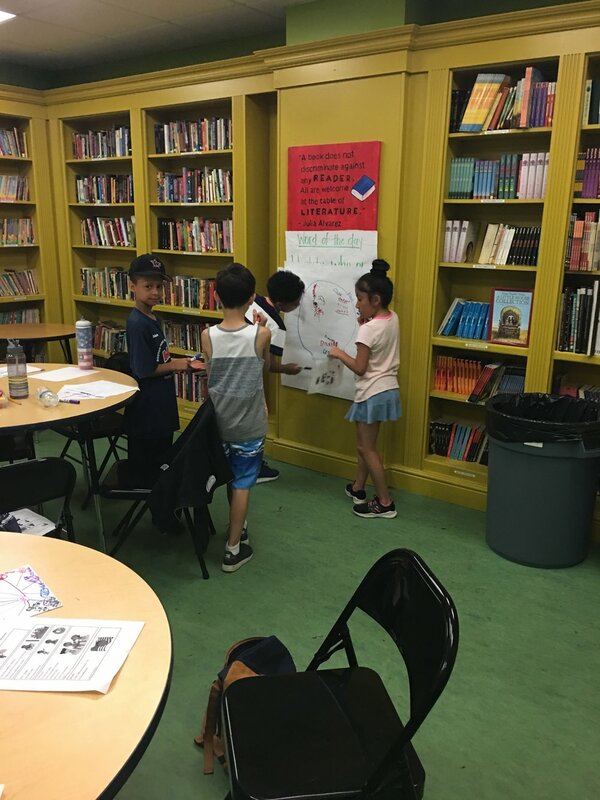 To learn more about the library and to explore volunteer opportunities, contact Maureen Burns at maureen@ssypboston.org or stop by the Blackstone School to ask a library volunteer for a tour. We, the JCITs, dedicate our loyalty and respect to the people around us. Although we are funny and energized, we persevere through problems like gun violence. We strive to stay calm and positive during challenging times in our community! We are the JCITs. You look at another wall and see a bookshelf with affirmation jars. Within our space we encourage each other to recognize and appreciate one another. Every person in our space brings something special to our small community and it is important that we remind people that they are important! In our hallway, Abby, our Lesley Grad Art Therapy Intern has made each one of us a Bitmoji. They are representations of us in cartoon form and she gave us the freedom to choose our outfits and hairstyles that show who we are. Also in our hallway, is our Art for Social Change Wall. The JCIT leadership development curriculum is heavily focused on how to use art for social change in the forms of photography, videography, poetry, music, drawing, etc. We encourage our teens to find the purpose behind the art on the wall, what it means to them and how they may connect with it. You finish the room off with some string lights, blow up chairs, basketball hoops, posters of Muhammad Ali and Bob Marley and you feel at home. The only thing that makes this space even better is when every JCIT and adult staff are present and now, not only do you have a home...you have a family to fill that home. Come check out our space on the 3rd floor of The Church of St. Augustine and St. Martin on Lenox Street! Take it a step further by joining our JCIT Program! We are always welcoming new faces! 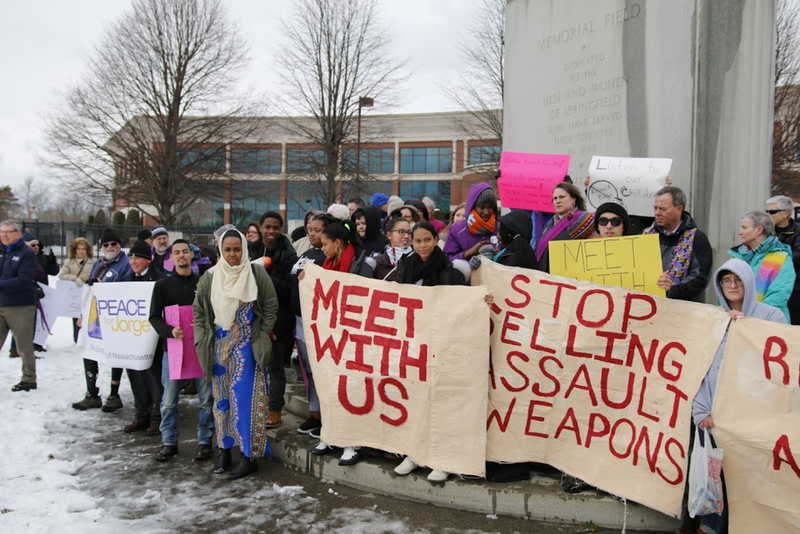 Their action at Smith and Wesson in Springfield is part of a national moment and movement against the gun violence that is nothing new for so many of them. 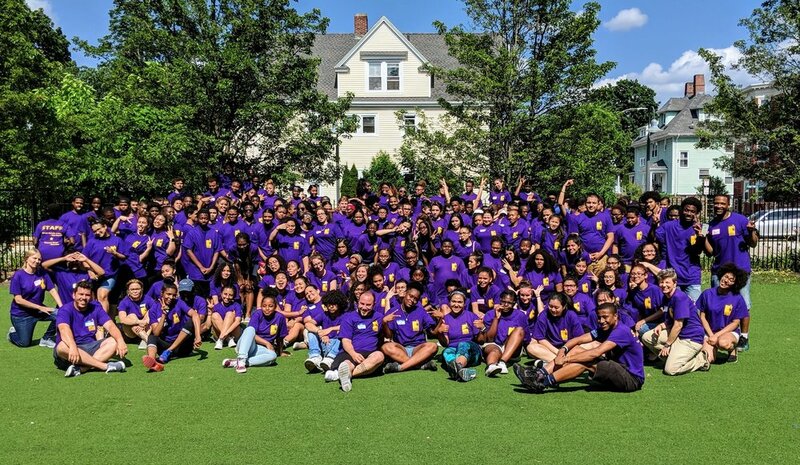 Many of these young leaders were heart-broken and outraged when tragedy struck in Dorchester and reverberated through the communities where Jorge Fuentes had been a part of in Boston and beyond. Jorge was shot and killed outside his home while walking his dog in September of 2012. His senseless murder galvanized those who knew him to take action to prevent future gun violence; together with then Bishop M. Thomas Shaw of the Episcopal Diocese of Massachusetts they formed The B-PEACE for Jorge Campaign, the diocese's ongoing effort to address the underlying roots of violence. While not new for the B-PEACE for Jorge leaders, the issue of gun violence has never captured the public’s attention in quite this way before. Last Saturday, these same B-PEACE young people and adult allies were marching alongside hundreds of thousands of others in the streets in Boston and Washington, DC. At the Boston March for Our Lives, members of The B-PEACE for Jorge campaign showed up wearing the purple shirts and white buttons emblazoned with Jorge’s face that they have been wearing in his honor for years. In Washington, D.C., Emma Gonzalez’s powerfully moving speech was particularly resonant for Boston teens who had traveled there for the action. As Gonzalez spoke about the urgency of taking action to end gun violence in our streets and in our schools, they could see she was wearing on her jacket the same B-PEACE for Jorge button they wear every day. To follow the lead of young people in our neighborhood and across the country in this movement to end gun violence, join B-PEACE for Jorge teens in local actions and campaigns. Email sarah@ssypboston.org to get involved.